OMG Posters! 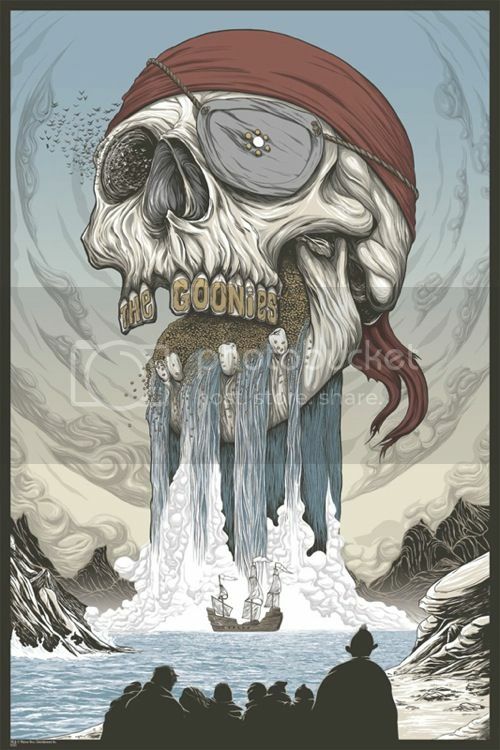 » Archive The Goonies Poster by Randy Ortiz (Onsale Info) - OMG Posters! Mondo will release this new Goonies poster by Randy Ortiz later today. It’s a 24″ x 36″ screenprint, has an edition of 320, and will cost $45. It goes up today (Thursday, August 2nd) at a random time. Visit Mondotees.com. Too cool. Crossing my fingers that I get one. Yeah me too! Love the Goonies and this print! WOW! Easiest drop ever for me! In and out in literally 20sec! Victory for me as well! Couldn’t be happier. Well, once again I didn’t score one, but definitely love this print! I almost wish Randy brought up the character silhouttes more and did the titles/credits on the poster – but then again, I would’ve wanted to see the title larger/located somewhere else. That being said, I think the design itself is absolutely gorgeous… congrats to those who snagged one!